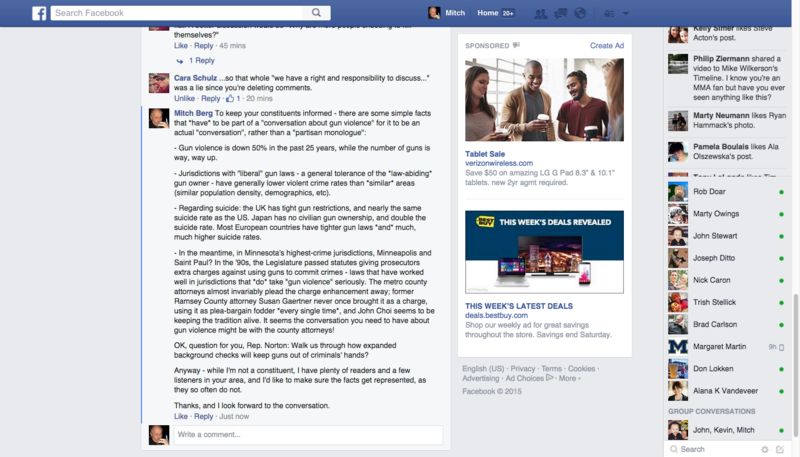 Over on the Facebook, Rep. Kim Norton – about whom we talked the other day – has asked for a “conversation about guns”. And, per usual DFLer practice in “conversations”, she seems to be deleting every comment that represents the other side of the “conversation”. If you’re a Second Amendment supporter from the Rochester area, by all means, sound off in Rep. Norton’s space (with a polite, well-reasoned argument, natch). Let us know how long it takes for your comment to get whacked. UPDATE: It took ten minutes. She also banned me from responding to any posts on her Facebook page. They are not from my district, Jared. They have signed on for the purpose of lobbying. I have this sight for informational purposes and to share with my constituents. Please use my legislative email for lobbying or, even better, for suggestions!! But she’s proposing laws that affect more than just her constituents; she’s put herself in the position of being the state’s lead for gun control efforts in the coming session. If you live in her district, please sound off. Mitch Berg here. I’m a host at AM1280 in the Twin Cities; I have a pretty sizeable audience in your district, over the air and via the internet. I’m on the air every Saturday from 1-3PM – and I’d like to extend an invitation to you to come on my program this coming Saturday to talk about your “gun violence” proposals. I’m wide open this Saturday; I’ll make 30-60 minutes available to discuss the issue in the sort of depth most media don’t allow. And if you’re not free this coming Saturday, I’ll extend the offer; ANY Saturday afternoon between 1-3PM, between now and your retirement from the legislature, I will open for you and this conversation, whatever it takes. I sincerely do look forward to your reply. PS: I would understand your reticence about coming on a “Conservative” talk show. However, I have a long record of civil, productive interviews with people I disagree with. RT Rybak and Dane Smith are references! Again, I hope we can talk on the air soon. UPDATE 3 : Well, not tomorrow. Notwithstanding the very specific proposals she laid out in the Rochester paper, she says she’s just researching the issue, and has no specifics in mind, and perhaps we’ll talk when she has a bill written. The invite will stand until the end of the session. This entry was posted in Big Gun Control by Mitch Berg. Bookmark the permalink. I’m in her district. I’d love to piss her off. The Post-Bulletin lavishes her with tongue swipes. You’re being civil to her, which means she’ll wait until your back is turned before driving the blade into your back. You miss her point, Mitch. Guns are self-firing. They’re like SUV’s; evil machines which assume a life of their own and run over innocent people – while polluting the air. Your paradigm needs tweaking. She’s making a spectacle of her self.